There’s a special place in my heart for big, bold adventure movies like John Carter. In an age where detached irony seems to permeate every recess of our lives, John Carter throws out names like “Zodongan”, “Therns”, “Tharks”, and “Barsoom” and doesn’t blink an eye. This is the world of John Carter and co-writer/director Andrew Stanton mostly lets the world open up at its own pace. The conflicts are laid out cleanly, the lead characters are compelling, and eventually you’re not wondering about the difference between Zodongans and Heliumites and how a guy from 19th-century Earth was drawn into their conflict. You’re too enraptured by the majesty of the red planet. You’re also too busy laughing at the good-natured humor and being sucked into the exhilarating action. John Carter starts off by introducing us to the civil war on Barsoom (the planet we call “Mars”) between the Zodongans and the Heliumites. The leader of the Zodongans, Sab Than (Dominic West) has acquired an unstoppable weapons given to him from a seemingly all-powerful race known as the Therns. Heliumite princess and scientist Dejah Thoris (Lynn Collins) is trying to unlock the secret to the Zodongans’ power before she’s married off to Sab Than so that Helium can form a truce between the nations, although the “truce” is really more of a “Please stop killing us and we’ll do whatever you want. Here’s our smart and beautiful princess to sweeten the deal.” Swept up into this planet-wide conflict is former Confederate soldier John Carter (Taylor Kitsch), who wants no more part of war and simply wants the riches of a cave of gold he found on Earth. Unfortunately for Mr. Carter, he encounters a Thern on Earth, gets transported to Mars, and begins an odyssey filled with strange creatures (like the six-limbed, violent Tharks) and fantastical vehicles that can “travel on light”. While we may giggle a bit at the names, Stanton hooks us with visual spectacle and grand conflict. Before the exposition on Mars threatens to lose us, we’re moved to Earth and meet Carter. It’s a bit of a gamble to show the spectacle and then hit us with the familiar rather than vice-versa, but it’s the pattern of John Carter‘s excellent pacing. Before the movie starts feeling like Dune, we get to see Carter be a badass, get some great laughs as he tries to escape from a U.S. colonel (Bryan Cranston), and when Carter lands on Mars, the humor eases us back into the strange stuff like his capture by the Tharks. John Carter manages these tonal transitions with tremendous skill throughout the story. One scene can have John Carter feeling helpless and trapped, and the next scene can have him paling around with Woola, his faithful, super-fast, ugly-yet-adorable dog-like creature. It’s a masterful balancing act where the pacing, visuals, plot, and characters have to work in sync to transport the audience to worlds within worlds. This isn’t simply a modern-day guy hanging out with one alien species. It’s a conflict with lots of players and the movie puts them in a world worthy of that conflict. Furthermore, John Carter isn’t simply a world-saving cipher. The characters are archetypes and some are more fleshed out than others (translated to English, Sab Than probably means “Bad Guy”), but Carter’s backstory has a meaningful tie to his situation on Mars. Granted, the subtext is simplistic and thematically there’s hardly anything to chew on, but sometimes painting in the broad strokes of “Honor”, “Love”, “Redemption” fits the bill. While the script has no problem with going broad, the excellent cast manages to bring their characters to life by making them more than Hero, Love-Interest, Chieftain, etc. I believe in John Carter because Kitsch sells his character’s reluctance, pain, bewilderment, and moral code (and thankfully, John Carter is not “the chosen one who must answer the call”). Collins plays Dejah without the interminable “tough chick” clichés. Yes, she knows how to wield a sword and the character is really smart, but Collins’ is unafraid to show Dejah’s vulnerable side, which is essential to strengthening the character’s determination. For the most part, John Carter does a solid job of showing that John and Dejah are equals, although he has to save her from plummeting to her death one time too many. On the motion-capture side, the performances are even more crucial to making us believe in the Tharks. Like almost everything in John Carter, the Tharks are silly at first glance, and it takes strong writing and acting to push us past the appearances. Willem Dafoe is great as the Thark leader Tars Tarkas, a character who has to constantly hide his compassion among his combative people. The digital artists do their part, but it takes actors like Dafoe to make the character more than CGI. John Carter is a visual effects extravaganza, but Stanton captivates us not only with ground-breaking effects, but by pulling everything together as a cohesive whole. It’s not enough to simply show John Carter zipping around on airships. The airship has to be part of a culture and the culture has to come alive through its representative characters. This is what good epic stories do. They take the time to set up the world and the characters, and only then does the action come alive, as opposed to one CGI thing fighting another CGI thing. And when the action in John Carter comes alive, it’s absolutely spectacular. The 3D doesn’t get in the way, provides a nice depth of field, and the world is so big that an IMAX screening would be worth your time. John Carter the kind of visual feast that only a movie theater can provide. It’s a jarring and unworthy finish to a vivid and memorable movie-going experience. 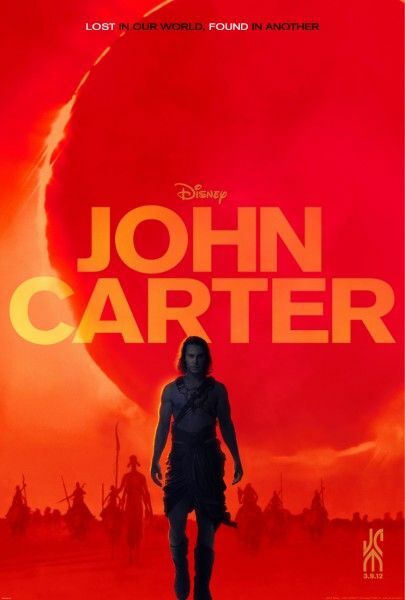 John Carter is a swashbuckling tale (Carter even uses swords instead of guns) that measures up to and in some ways exceeds the vision of the source material, Edgar Rice Burroughs‘ 1917 novel, A Princess of Mars. Andrew Stanton has taken an old-fashioned adventure and given it a high-tech body. John Carter is visually stunning, thoughtfully constructed, and most importantly, the film is grand, goofy, old-fashioned fun.